Whitley Warriors can confirm that Jordan Barnes, Alex Lawson and Martin Crammond will all be on the clubs roster next term. 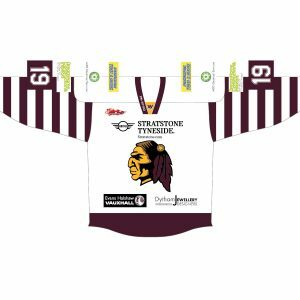 All 3 players iced for Warriors last term and have been re-signed by Whitley’s new player/coach David Longstaff as Warriors prepare for the NIHL North Division 1 2015/16 campaign. 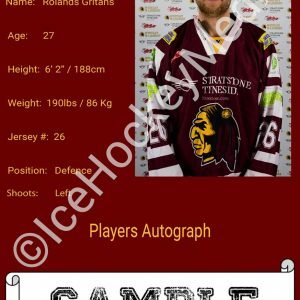 Long serving Warriors forward Martin Crammond will again be wearing the maroon and gold of Whitley next term. Martin has been around the senior set up for the last decade now and the industrious frontman brings an abundance of energy and guile to the Warriors set up. Martin gave his opinions on the up coming season from a Whitley perspective. “I’m really looking forward to this season, this will be my 10th consecutive season for the Warriors and this is the most excited I have felt in a long time. I’ve played with one of my heroes as a kid in Simon Leach and now I have the opportunity to play with another hero of mine in David Longstaff, which will tick another box for me personally. Alex Lawson will also be part of Warriors plans next season, the versatile 21 year old is hoping to be fit for the start of the campaign he is currently getting back into training after picking up a leg injury out on the ice towards the end of last term. Alex who can comfortably play both as a forward and in defence tallied 12 points for Warriors in 2014/15 despite playing in a number of different positions on different lines. Once he regains full fitness he will be able to join his brother Richie in the Warriors first team squad on a regular basis. Alex shared his thoughts on how recuperation from his injury is going and his take on the upcoming season. “The Injury is healing very well. It’s been 10 weeks now and luckily things aren’t as bad as what they first appeared. I haven’t needed any surgery just a lot of rest and physio which is now starting to pay dividends. I am back in the gym now progressing with strength training and I aim to be fully fit for the start of the new season. “The announcement of David Longstaff (Lobby) as head coach is fantastic news after a disappointing year last year. I think it will be a completely different year this time round. I believe next year we will be able to compete with the top teams in the league otherwise we wouldn’t be fulfilling our full potential. Another player who unfortunately suffered injury problems last season was power forward Jordan Barnes who suffered a serious knee injury shortly into the campaign in an away game up at Solway. Over the summer months Jordan will begin training again before getting back on the ice as he bids to overcome his injury nightmare. It is not yet clear whether Jordan will be fit for the beginning of the 2015/16 NIHL North campaign however it should not be too long into the season before Warriors number 17 will be back playing again in a competitive match up. 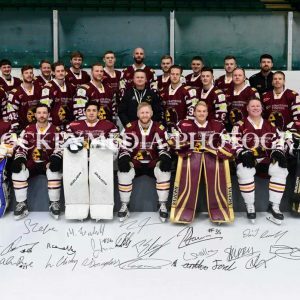 Warriors fans are reminded to keep an eye on the clubs website and the local press as Whitley will be releasing more information regarding their playing roster in the near future.